"In 2005, a group of independent Met Foods operators decided to split off from Met, then under the supervision of White Rose Foods, and form their own cooperative. This was probably the largest single blow to the Met Foods group, and the already-struggling cooperative started its quickly-increasing decline. The bankruptcy of White Rose put the vulnerable Met and Pioneer Supermarkets banners up for sale, and they were taken over by then-called Associated Food Holdings, today's Associated Supermarket Group. "The group of operators that split off in 2005 reorganized itself into the Neighborhood Supermarket Association, or NSA. This new group got the attention of Massachusetts-based Americas' Food Basket, a small chain of Hispanic-leaning supermarkets. Americas' Food Basket joined around 2007 and switched their stores to NSA Americas' Food Baskets. In 2012, however, NSA faced internal problems and reorganized its corporate division into today's America's Food Basket, borrowing the name of their largest member (save for the moved apostrophe, which interestingly enough switches the meaning from all of the Americas to just America -- as in the USA). 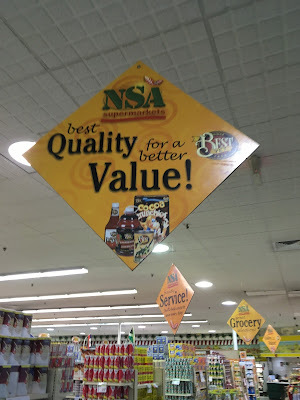 "Almost all NSA Supermarkets were re-branded with AFB's new banner, Ideal Food Basket, and the NSA Americas' Food Basket stores became America's Food Basket stores. Some stores, still equipped with the NSA logo on the storefront, replaced it with a similar AFB logo. Today, AFB (whose corporate division uses a different logo from the stores of the same name) operates independent Ideal Food Baskets, Ideal Fresh Markets, Ideal Marketplaces, America's Food Baskets, SuperFi Emporiums, and others." All caught up on your history? Great! Notice how I say "almost all NSA Supermarkets were re-branded". There's one that I know of that hasn't yet been rebranded as Ideal or something else, and that's this location in New London, CT, a former C-Town across the highway from a huge ShopRite. I think, though, that this store is on the New London downtown side of the highway (I-95) so people who don't drive don't cross the freeway to shop. Not too impressive from the outside. It's fine but nondescript. And I guess NSA doesn't light up. You enter actually to the right of where it says "WINE & LIQUORS" on the left, and turn 90-degrees to your left. Produce is in the first aisle, along with deli/bakery. Meat and seafood are along the back wall. Frozen foods are in the second-to-last aisle with dairy in the last. You enter on this side of the apples to the right, behind the checkerboard tile. One disclaimer about my photos -- I was here late in the evening soon before the store closed for the night, so if it looks a little empty of products and people, that's why. I do like the effect of the wavy green stripes above produce, but they could have done something better with the lighting. Here's the entrance (to the right) and exit (to the left). Funny how "Thank you for shopping with us" in English becomes just "Gracias" (thank you) in Spanish! Looking from the back of the grand aisle towards the front. Deli and bakery are to my right here. Deli/bakery/hot foods and a small seating counter under the black and white checkerboard. Feels like there should be something else here. Deli, bakery, and hot food were closed for the night. Hot food is maybe closed for good. I don't know. There's a small seafood counter at the back of the grand aisle. Meat continues along the back wall. The grocery aisles are pretty standard. Not really exciting. The aisle markers clearly reflect the store's past as a C-Town. "Supermarkets for Savings" is C-Town's slogan. You can tell the NSA logo is a sticker over the C-Town logo. Frozen foods in the second to last aisle. The cases were pretty old, but mostly in decent condition. It's not hard to tell which cases' lights have been replaced! In the back corner was this (presumably broken) refrigerator case. Well, maybe New London residents really love tomato sauce! Dairy in the last aisle. Customer service and HABA were in the front corner. Hmm, I think someone didn't plan this sign very well. NSA best Quality for a Best Yet better Value? Anyway, this store doesn't sell Best Yet storebrand products anymore, they use Essential Everyday from Supervalu. One last look at the front-end. While there's nothing wrong with this NSA Supermarket, there's also nothing special about it. As always, I'm glad it's there, but there's not much to comment on. I visited this store with my mother, who told me after she thought looking up was better than looking down -- the signage, decor, and decorations were nicer than the floor, fixtures, and shelves. That's a good way to put it. I don't know how this store compares to the ShopRite across 95, though. Any input?